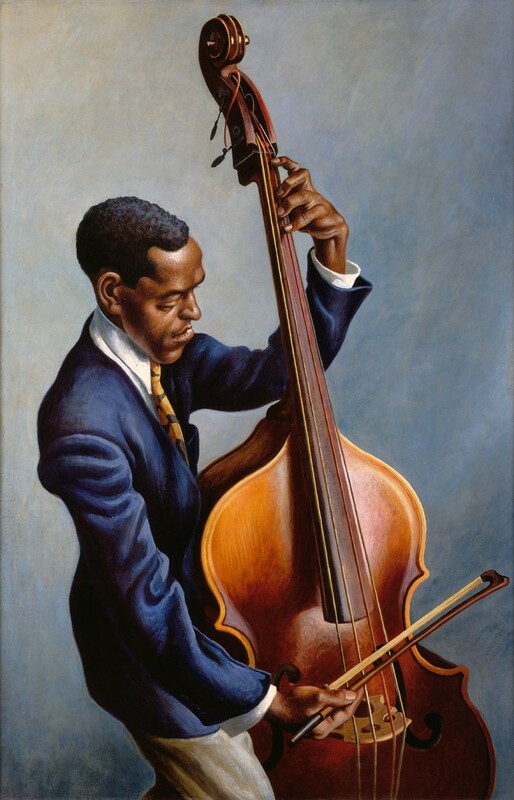 This exhibition includes approximately 100 works by Benton: 50 paintings and murals along with a selection of his drawings, prints and illustrated books. In addition, throughout this exhibition, Benton’s art is paired with historic movie clips. These pairings present opportunities to explore how both Benton and filmmakers created engaging visual stories with popular appeal. 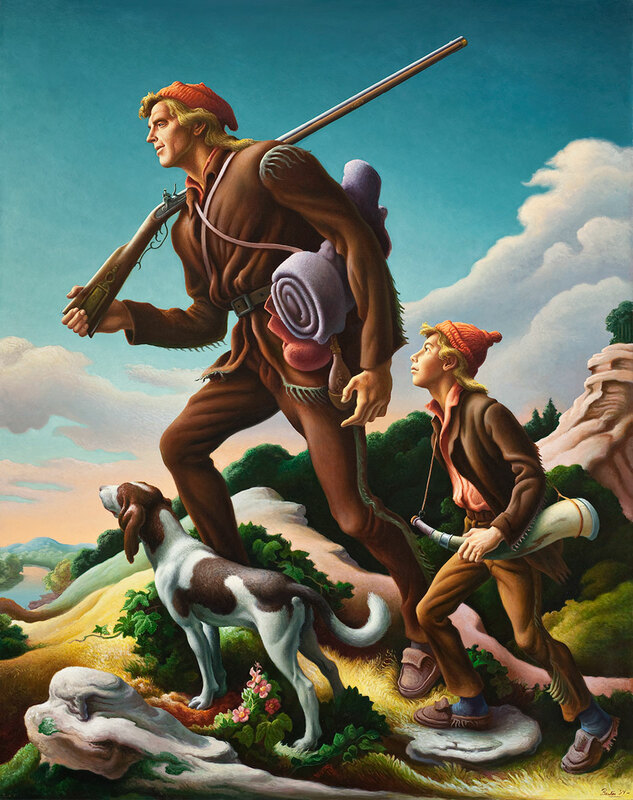 The exhibition’s thematic sections—Presenting Benton, Modern Mythmaking, Creating an American Historical Epic, Hollywood Calling, Casting Characters, Painting World War II, Benton at Home and Benton’s Westerns—demonstrate the fascinating relationships between Benton’s art and movie making. 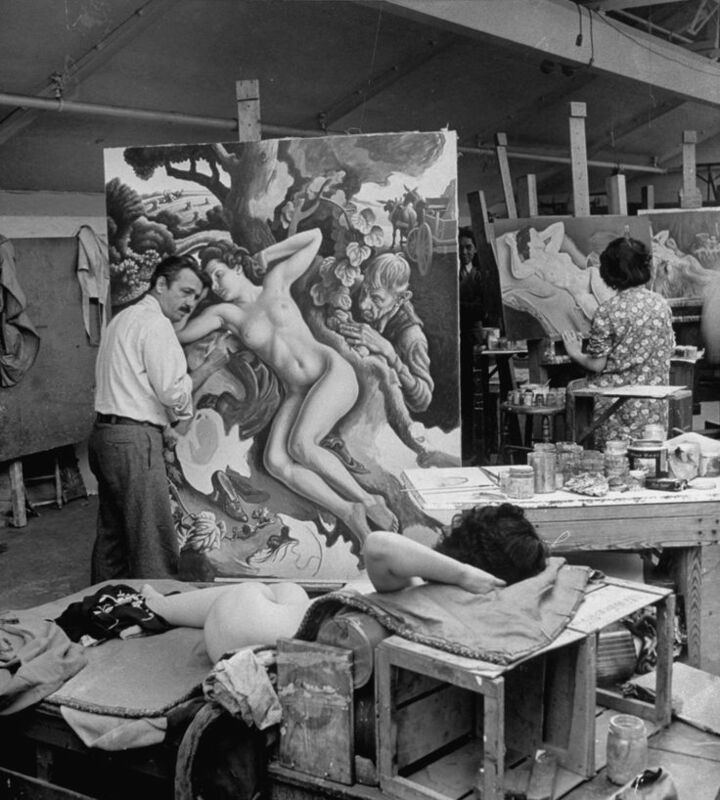 Around 1917, Benton worked on silent movie stage sets in Fort Lee, New Jersey—the first “Hollywood.” Between 1937, when Life magazine sent the artist to Hollywood on commission, and 1954, Benton painted five major works for projects related to motion pictures. This exhibition is the first to connect these experiences to the rest of the artist’s career. Benton was acutely aware of contemporary storytelling’s shift toward movies, and he achieved his greatest fame during the so-called golden age of Hollywood when more than two-thirds of Americans went to the movies weekly. During the early 30s, American artists began a departure from the work of their European counterparts, instead looking to their own surroundings for inspiration. In 1934, TIME magazine gave a name to this trend: the “U.S. Scene” or “Regional art”. 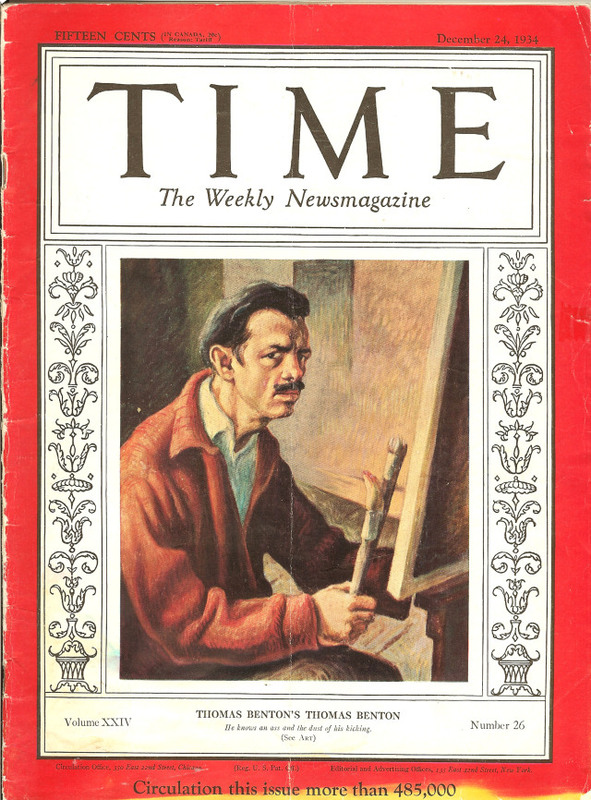 The corresponding article recognized Benton’s influence as a leader in the movement, and, appropriately, the cover featured Benton’s 1925 Self-Portrait. A complementary installation to this exhibition opens Nov. 11 in Gallery 214. 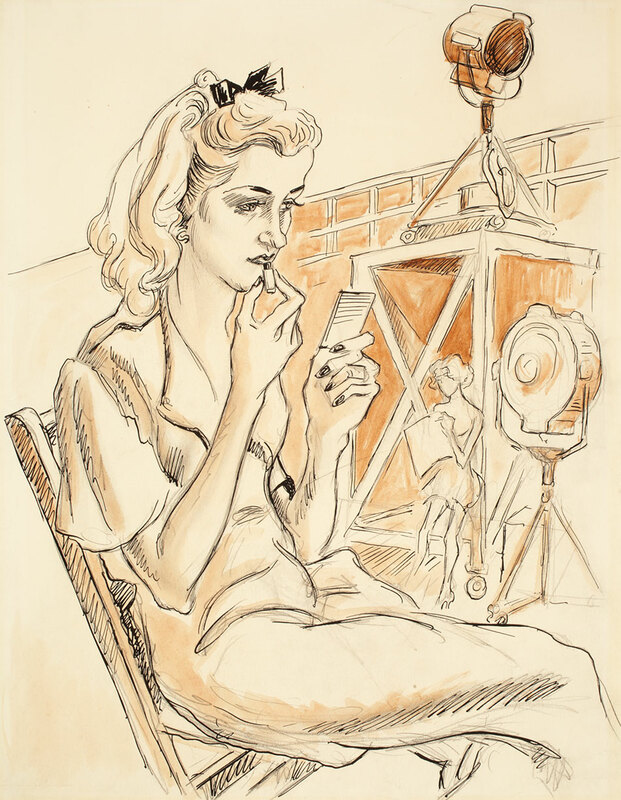 American Art–In Preparation includes a number of Benton’s preparatory studies to illustrate the artist’s process. This rotation is Andrew W. Mellon Undergraduate Curatorial Fellow Issac Logsdon’s curatorial debut. The Nelson-Atkins holds the largest collection of Benton’s works, including the painting Hollywood, and his masterpiece, Persephone. Many of these works will be incorporated into the exhibition, American Epics, or will complement the show by being on display in the American Galleries. 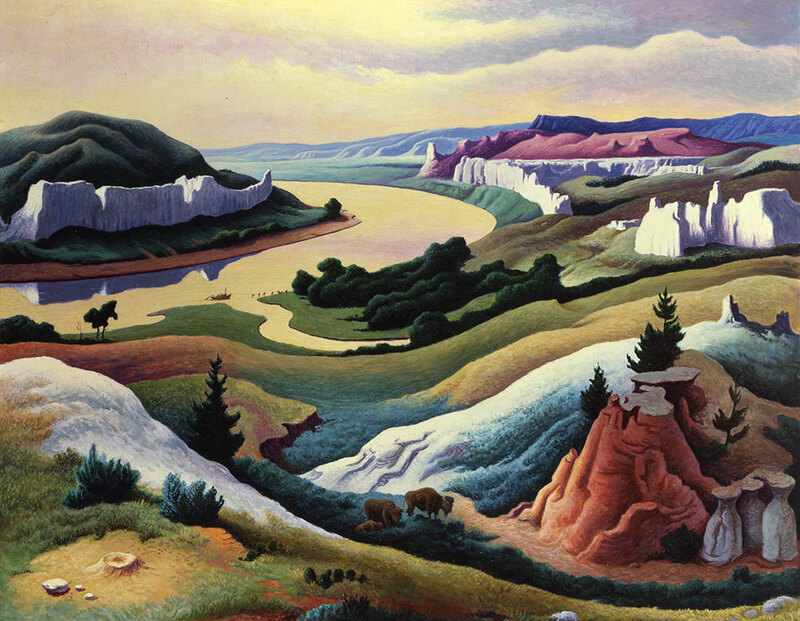 “This is an ambitious and fresh approach to the quintessential American artist Thomas Hart Benton that reveals important but previously overlooked connections between his art and the golden years of Hollywood,” said Julián Zugazagoitia, Menefee D. and Mary Louise Blackwell CEO & Director of the Nelson-Atkins. 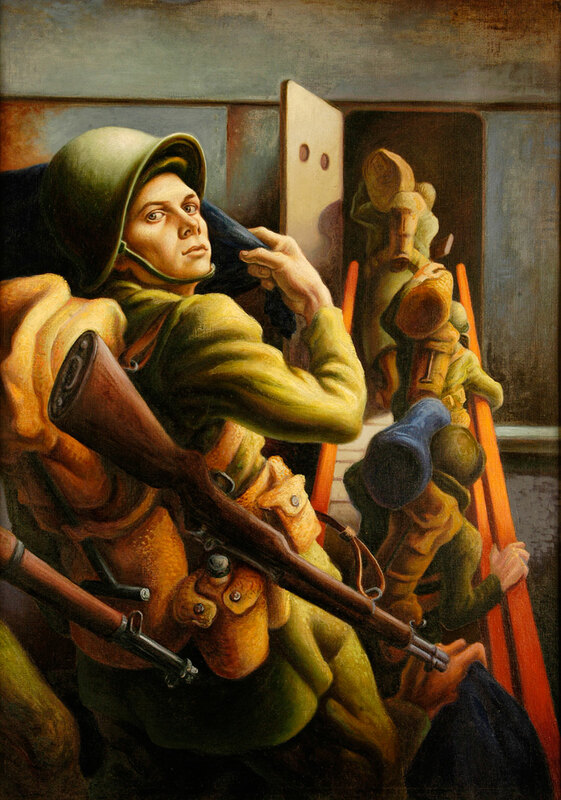 “For the first time, we are able to see the allure of Benton’s paintings as cinematic narratives in their content and composition.”American Epics: Thomas Hart Benton and Hollywood invites audiences to explore how artists and filmmakers create visual stories about artistic, cultural, and national identity. 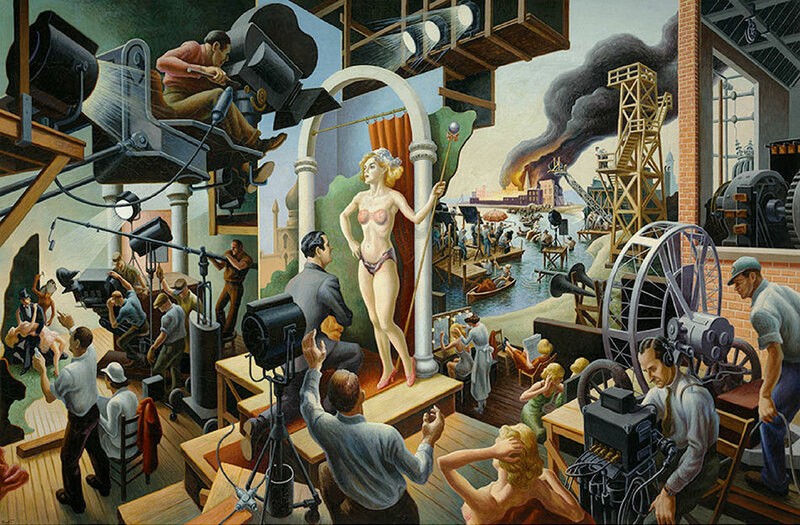 “Concurrent with the so-called golden age of Hollywood, Benton developed a painting style that was cinematic in process, composition and content to express his interest in American people and American stories, broadly defined. His paintings and murals melded elements intrinsic to recent motion pictures with centuries-old European painting traditions that resulted in visually dynamic narratives. 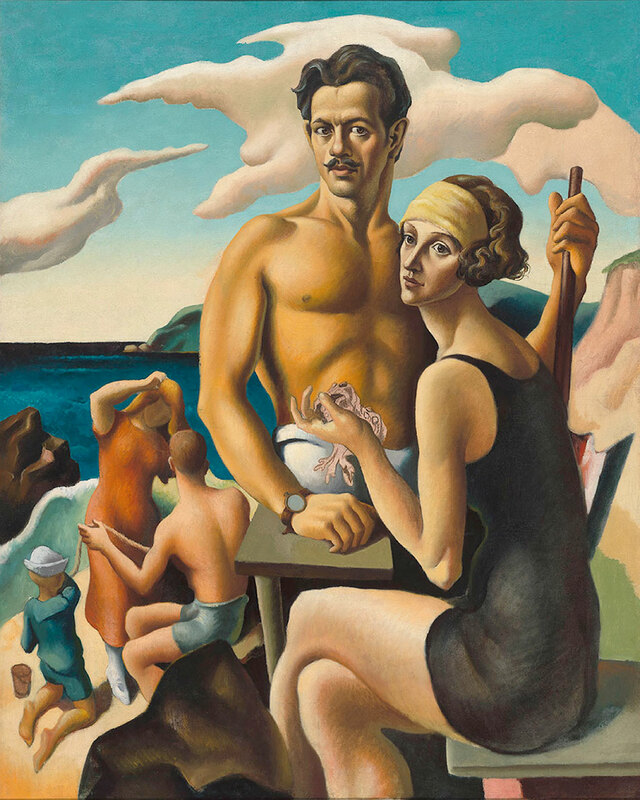 These qualities, in addition to Benton’s celebrity status as a nationally acclaimed artist, made his work especially alluring to both the public and Hollywood,” said Stephanie Fox Knappe, Samuel Sosland Curator of American Art at the Nelson-Atkins. Hours: Wednesday, 10 a.m.–5 p.m. Thursday/Friday, 10 a.m.–9 p.m.
Saturday, 10 a.m.–5 p.m. Sunday, 10 a.m.–5 p.m.
American Epics: Thomas Hart Benton and Hollywood on Thursdays from 5–9 p.m.
For museum information, phone 816.751.1ART (1278) or visit nelson-atkins.org. The Nelson-Atkins is located at 45th and Oak Streets, Kansas City, MO. 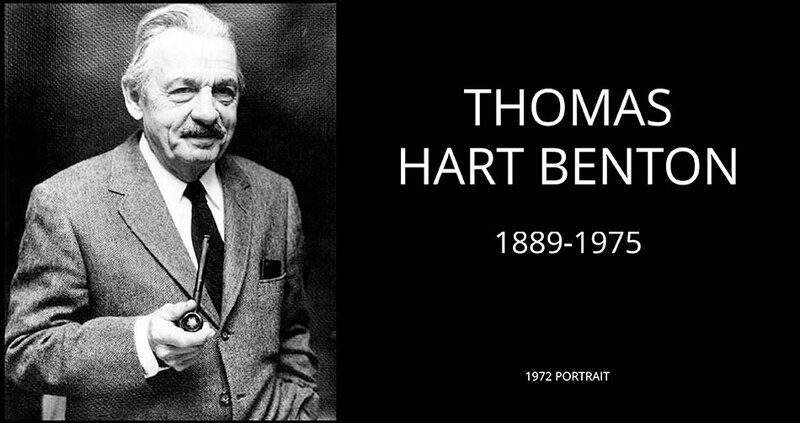 * American Epics: Thomas Hart Benton and Hollywood was organized by the Peabody Essex Museum, Salem, Massachusetts, in collaboration with The Nelson-Atkins Museum of Art, Kansas City, and the Amon Carter Museum of American Art, Fort Worth, Texas. Austen Barron Bailly, George Putnam Curator of American Art at the Peabody Essex Museum, Salem, MA, and Mary Schafer, Conservator, Paintings at the Nelson-Atkins, discuss Benton’s dynamic paintings to celebrate the opening day of the exhibition. The museum screens three classic films connected with Benton’s artistic vision and highlighted in the exhibition. Introductions by noted film scholars precede each screening. 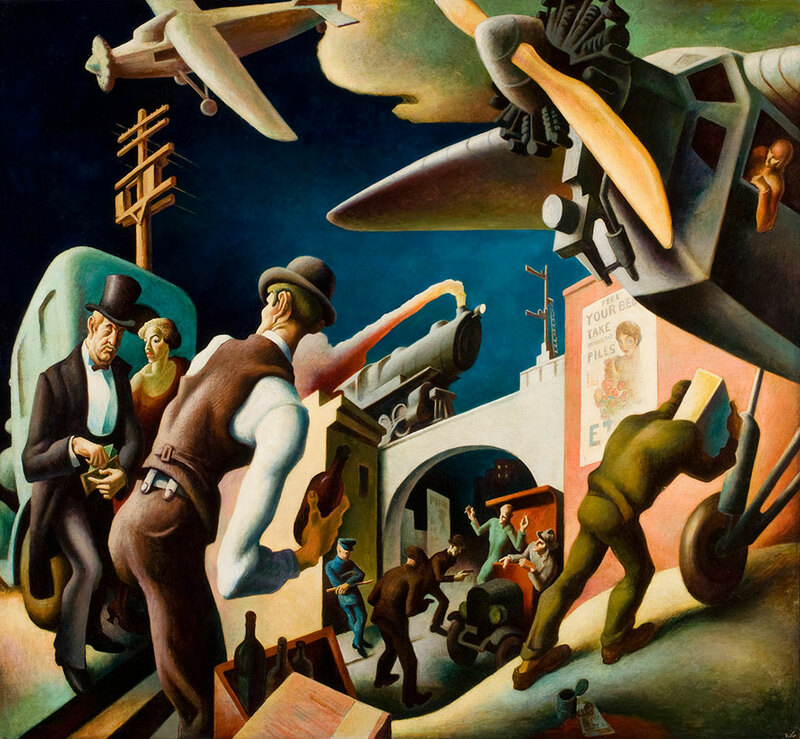 Join Erika Doss, Professor, American Studies at the University of Notre Dame, as she discusses how the movies inspired Benton’s storytelling sensibilities and his dynamic painting style, and shaped his perspectives on public art and American history. Your not-so-quiet night at the museum! Honoring the spirit of old Hollywood, November’s Third Thursday includes exhibition-related activities, performances and more. Hear six five-minute stories about Kansas City’s famous son from those who knew him or have been inspired by him. Then share your own thoughts and reflections with speakers and fellow participants during an intimate remembrance. The national tour of this exhibition is sponsored by Bank of America. In Kansas City, this exhibition is supported by Paul DeBruce, Shirley and Barnett C. Helzberg, Jr., the Committee of 100, the Marguerite M. Peet Museum Trust, John and Kay Callison, James B. Nutter & Company, the R.C. Kemper, Jr. Charitable Trust, UMB Bank, n.a., Trustee, Ann and Kenneth Baum, Henry W. Bloch, Nancy and Rick Green, Belger Cartage Service, Inc., the Barton P. and Mary D. Cohen Charitable Trust, the Hunt Family Foundation, the Sosland Foundation, the Thomas & Sally Wood Family Foundation, the Elizabeth C. Bonner Charitable Trust, the Nelson-Atkins docents and our Honorary Committee. This exhibition was made possible in part by a major grant from the National Endowment for the Humanities: Celebrating 50 years of Excellence, with additional support from the National Endowment for the Arts. The exhibition is supported by an indemnity from the Federal Council on the Arts and Humanities.